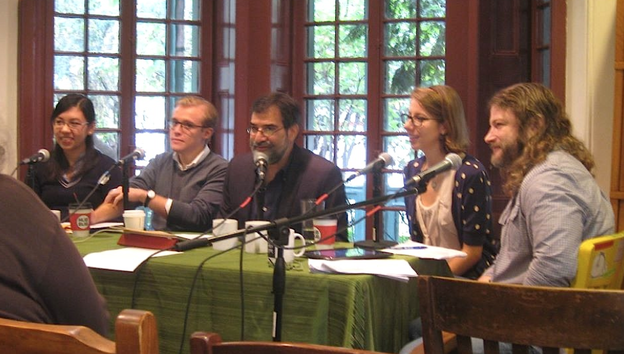 ModPo — a free, entirely open, non-credit, discussion-based 10-week course on modern & contemporary U.S. poetry — begins its 2014 session on September 6. Everyone is welcome to join us. Click here — https://www.coursera.org/course/modernpoetry — to enroll. ModPo 2014 includes several new features in addition to the 10-week survey of mod American poets & poems. New is an entire set of resources for teachers. (We encourage teachers at all levels to join us.) And new, too, is “ModPoPLUS,” a supplemental syllabus that parallels the main ModPo syllabus — additional poems, links to audio and video, and video-recorded close readings of the poems. ModPo people gather together for meet-ups in many majors cities around the world. The ModPo team this year will be coming to New York, Washington DC, and Prague. If you are new to modern poetry, join us anyway and don’t worry: TAs and Community TAs (people who have taken ModPo before and are volunteering to help with discussions) and your instructors stand by pretty much always to guide you and answer your questions. And ModPo hosts weekly live interactive webcasts. ModPo is committed to the idea that massive open online courses need not be impersonal.